Sorry but we are currently out of stock and will be making more. Thanks for your patience. This Is No Ordinary Boot Sock. Over The Calf-New and Improved version of our original white sock. Now with Copper Mine yarns too! This sock was designed from the ground up to give more comfort and better shooting performance to Cowboy Action Shooters. It combines the best of wicking and padding for all day comfort in your boots! • Lighter/Longer "Stay Up Top" is breathable and snug- Never Falls down. • Ultra Padded Foot- Filled with CoolMax pile wicks and pads your feet. 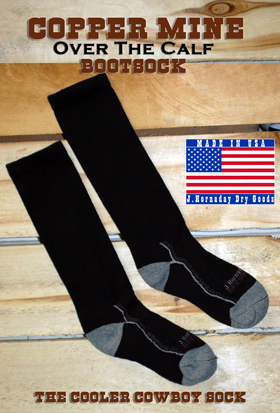 • Strategic Air vents are placed throughout the sock to allow breathability. This is the first bootsock I have worn that I can remove my boots after a days shoot without a boot tree. They don't stick because they are dryer. Try 'em , I think you'll like 'em.